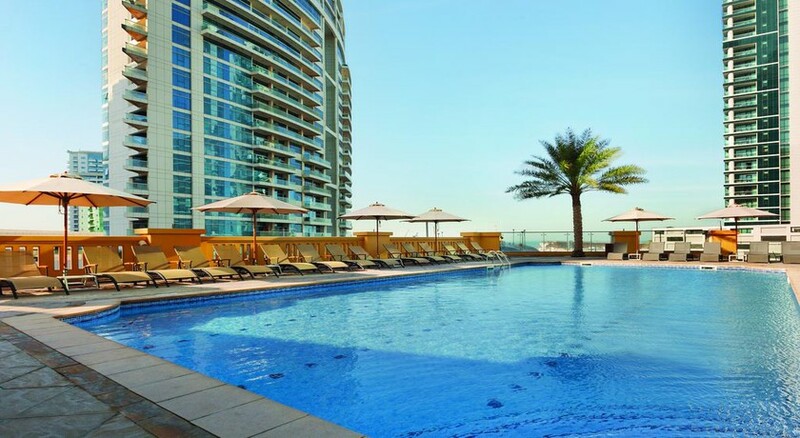 Sitting in a prime location between Jumeirah Beach Residence (JBR), Dubai Marina, and The Walk, Hawthorn Suites by Wyndham Dubai features a variety of family entertainment and leisure facilities. Spacious cosmopolitan design oriented rooms with all the necessary amenities make this hotel a favourite among Dubai travellers. This property is the definitive urban escape for all kinds of travellers who enjoy world class hospitality blended with the luxury and convenience of home. Hawthorn Suites by Wyndham is surrounded by a host of entertainment, dining, leisure and shopping facilities, which makes it perfect for a city break. 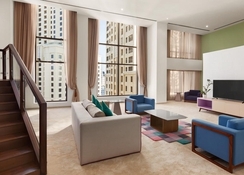 Its spectacular pent house provides marvellous views of Arabian Gulf and Dubai Marina. 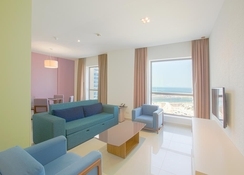 The beach is just 0.4km from the hotel, while the closest airport is Al Maktoum International Airport at 20.7km. 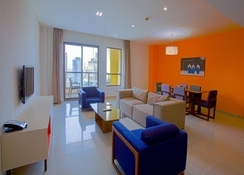 Hawthorn Suites by Wyndham Dubai JBR is within close proximity to Dubai’s main leisure and business places. If you are a beach lover, hit the Jumeriah Beach, where you can stroll, swim in the sea and relax on the sun loungers while having refreshing drinks. Burj Khalifa, which is the tallest building in the world is 1km from the hotel, so the guests can enjoy its dazzling view from the window of their room. Shopaholics will not be disappointed either, as the Dubai Marina Mall, Mall of the Emirates, IBN Battuta Mall and the Dubai Mall are close to the hotel. Featuring sleek decor and colourful touches, the bright rooms offer complimentary WiFi and flat screen TV's; some have Gulf views, too. The hotel has wide-ranging rooms to choose from for all kind of travellers. The rooms in this hotel are categorized as Deluxe Rooms, One Bed Room Suite with One King Bed & Kitchenette, Two Bed Room Hawthorn Suites, Panoramic 1-Bed Room Suites, Panoramic 2-Bed Room Suites and Pent House. All the rooms are uniquely designed, spacious and offer spectacular views of the Dubai city. All the rooms have all the necessary amenities, including coffee and tea making facilities, individual climate control, rollaway bed upon request, safe deposit box, mini-bar, baby cot, high speed Wi-Fi internet access, hair dryer, walk-in shower, bathrobe upon request, eco-friendly toiletries, international cable channels and DVD player upon request. Exceptional culinary delights await you at Hawthorn Suites by Wyndham. Satisfy your appetite with astonishing creations from the hotel’s expert chefs, whether you choose the vivacious ambience in the hotel’s dining restaurant, the glamorous feel of the Asian fusion restaurant or simply wind down in your comfortable room with the hotel’s 24-hour in room dining service. Flavours, an all-day dining restaurant, satisfies your every craving with its superb selection of international dishes. Hawthorn Suites Cafe La Maison Du Pain provides wide-ranging coffee, tea and many other refreshments that are perfect for a short break. Hawthorn Suites by Wyndham Dubai JBR offers first class sports and entertainment amenities to its guests, which will ultimately enable them to have a seamless experience when they are away from home. There is an outdoor swimming pool with sun lounger, where the guests can have a relaxing swim and refreshing drinks. 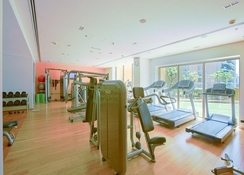 The health club in the hotel has state-of-the-art equipment, which will enable the guests to stay in shape when they are travelling. Those who want to relax, unwind and rejuvenate themselves can hit the spa in the hotel. There are wide-ranging treatments and massages available at the spa.